Nathan Adrian won the 50-meter freestyle Saturday at the Arena Pro Swim Series event in Austin, Texas, giving him the overall series lead and a sweep of the sprint distances. Adrian out-distanced the rest of the field coming in at the finish in 21.85 seconds. Bruno Fratus of Brazil was second in 22.07 while Jimmy Feigen was third in 22.27. Up-and-coming teen sensation Michael Andrew was fourth in 22.33. “I felt stronger on that swim than I did last night,” Adrian said in an online post-race interview. Adrian laughed when the announcer said it seemed like he could go a sub-22 second anytime he felt like it. “Anytime might be a little bit of an overstatement,” he said. Adrian said the buildup to the 2016 Olympic trials can be felt at each meet. While there was much ballyhoo surrounding Michael Phelps’ return to swimming, Bremerton’s Nathan Adrian left no doubt as to who really is the king of American sprinting on Wednesday. Adrian won the 100-meter freestyle at the U.S. National championships in Irvine, California. Adrian led at the 50, in 22.85 seconds, and won by a near half-body length in 48.31. Ryan Lochte was second and Jimmy Feigen third. Phelps was seventh. The win also gives Adrian his sixth national championship title. The top four individuals are added to the national team for the next two-year cycle and will head to Australia later this month for the Pan Pacific Championships in Gold Coast. Adrian wasn’t that impressed with his time. Adrian will swim in the 50 free prelims on Sunday. The psych sheets are available for the Mesa Grand Priz meet in Tucson. You can find them here. The 100-meter freestyle reads like a who’s who of swimming’s best. 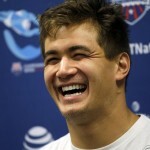 Olympic champion Nathan Adrian of Bremerton, who is ranked No. 3 in the world, is seeded first in the 100-meter freestyle in 47.52 seconds. Jimmy Feigen is second in 47.82 and France’s Yannick Agnel is third (47.84). Anthony Ervin (47.89), Ryan Lochte (48.58), Conor Dwyer (48.94), South Africa’s Roland Schoeman (49.00) and Michael Phelps (49.05) round out the top eight. That’s A LOT of international medals right there. Ervins is ranked first in the 50 free in 21.42, followed by Nathan in 21.47, Schoeman (21.67), Josh Schneider (21.78), Feigen (21.88), Matt Grevers (22.09), Karl Krug (22.15), Alex Coville (22.19) and Shayne Fleming (22.35). Nathan is ranked No. 6 in the world in the event. The 100 free is Thursday and the 50 free is Friday. Swim fans are dying to get to this event and it’s quickly become a star-studded affair. Within 48 hours of the announcement that Phelps would be swimming, the event was sold out. Michael Phelps and Nathan Adrian share a laugh at the FINA Swimming World Championships in Shanghai, China, July 31, 2011. FUN PICTURE OF THE DAY: I really like this picture. It was shot from the World Championships in China in 2011. Would still like to find out what they’re laughing about. Wouldn’t you? Bremerton gold medalist Nathan Adrian along with long-distance queen Katie Ledecky and Ryan Lochte are set to headline the next Arena Grand Prix meet in Mesa, Ariz.
There’s also this guy named Michael Phelps that will be swimming. Heard he’s pretty good. The meet is April 24-26 at the Skyline Aquatic Center. Prelims are at 7 a.m. Pacific time and finals are at 3 p.m.
Also competing will be 2012 Olympic gold medalist Matt Grevers, multiple Olympic champion Natalie Coughlin, Anthony Ervin, Jimmy Feigen, Tyler Clary and more. As for Phelps, his return to the pool is a welcome sight. His 22 Olympic medals are, of course, the most in history. It’s no surprise that the meet will be televised. Universal Sports Network will show live coverage on April 25 and 26. A live webcast will be available through USA Swimming for the entire meet. Olympic champion Nathan Adrian won by an arm length — an eternity in the 50-meter freestyle — to sweep the sprint events at the Austin Grand Prix meet Saturday at the University of Texas. Bremerton’s Adrian won in 21.89 seconds. California teammate Anthony Ervin was second in 22.48 while world champion silver medalist Jimmy Feigen was third in 22.49. The top four seeds were separated by just .13 seconds. Adrian had a shaky start, but bounced right back with a strong first 25 and barreled his way to the wall. Adrian won the 100 free on Friday in 48.26 in his first competition of the new year. Based on his times from Austin, he is now ranked No. 1 in both sprint events. Bremerton Olympic gold medalist Nathan Adrian will join several of his Olympic teammates at the Arena Austin Grand Prix meet at the University of Texas Friday-Sunday. Adrian will be joined by gold medal backstroker Matt Grevers, Tyler Clary, Natalie Coughlin, Anthony Ervin, Katie Ledecky and Allison Schmitt as well as Jimmy Feigen and Michael Klueh. Universal Sports Network will broadcast live Friday and Saturday at 4 p.m. (Pacific). A live webcast of the entire meet can be found at usaswimming.org. Prelims are at 7 a.m. (Pacific) with finals at 4 p.m. Prize money is allocated for first ($500), second ($300) and third ($100) for all individual events. Also, for the first time, the highest-scoring male and female U.S. winner will receive a year lease on a BMW ActiveHybrid 3 Series. Currently, Conor Dwyer and Megan Romano lead the GP Series after the first six meets. Since most of us likely reading this blog were unable to attend the 2013 Golden Goggles, you’ll have to check out this video from vloggers Eve and Candace and their interview of Nathan Adrian (it starts at the 3:05 mark) and Jimmy Feigen. A Washington native proved to be the fastest man in Texas on Saturday. Bremerton’s Nathan Adrian won the sprint freestyle shootout event in San Antonio, putting up a time of 18.79 seconds in the 100 freestyle to win the Josh Davis-inspired event in San Antonio. Adrian earned $10,001 as well as a belt buckle, boots and a cowboy hat as well. He held off Josh Schneider in 19.12 and Jimmy Feigen in 19.53. You can watch the race on YouTube by clicking here. Check him out in full Western regalia here as well as posing with friends for an old-time photo.